Abdel Moneim Aboul Fotouh - Who is Abdel Moneim Aboul Fotouh? Who is Abdel Moneim Aboul Fotouh? 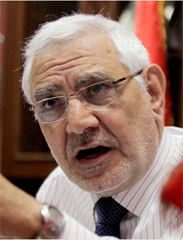 Abou El Fotouh was a high profile member of the Muslim Brotherhood’s reformist wing. Last year he defied the Brotherhood’s claim not to field any presidential candidates and declared his intentions to run for the presidential elections, causing the Brotherhood’s conservative leadership to expel him. Abou El Fotouh is a vocal supporter of gender and religious equality, and is trying to present himself as the most viable revolutionary candidate, the meeting point between moderate reformist islamists and secular revolutionaries. He believes military commanders should not enjoy immunity from prosecution for crimes committed against protesters during the transitional period. Moreover, as the SCAF tries to find a way to maintain its economic interests safe and its budget separate and secret, Abou El Fotouh has declared he would include the military budget in the overall state budget, and that he is “against the military having any role outside its duty of securing the safety of the country.” Notwithstanding the Muslim Brotherhood’s threat to expel anybody who supports his campaign, some analysts seem to believe that a considerable portion of the organisation’s rank and file could still vote for him.